Sunsilk, the brand co-created with hair experts, has opened up a virtual hair salon on a YouTube brand channel where users can get a complete hair makeover from the experts. Jab baal ho thick, any style karo pick! Sunsilk’s latest range of products under Keratinology, promises just this and a range of products that help you do that. The brand has been long associated with ‘co-creation with hair experts’. Moreover, it’s been an early mover to the digital medium with its ‘Gang of Girls’ website being quite a rage with younger women, mainly for its community features like blogs, message boards, chat, etc. 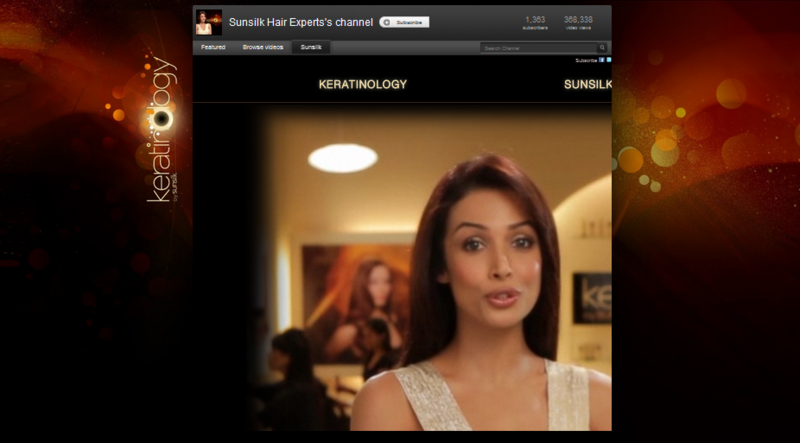 The hair experts have now chosen a new medium – YouTube, as an interactive extension to get the conversations going. Recently, I saw the Sunsilk keratinology ad on YouTube featuring Malaika Arora Khan and an enticing copy asking me to get haircuts, spas and colour at the hair studio with a link. I clicked on the link at once and was taken to the YouTube brand channel of Sunsilk. The brand channel is a virtual hair studio equipped with the best salon style treatment videos and recommended products for your hair. The channel has garnered 1379 subscribers and a total of 3,71,660 views on its videos at the time of writing this. Videos are mainly expert hair advice, how to’s and a collection of product demonstrations and usage guide. You can navigate to any part of the channel but the virtual salon definitely calls for an enriching experience! 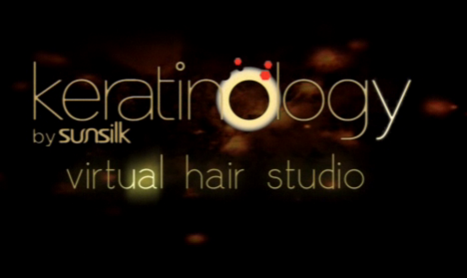 At the virtual salon, you are welcomed by Malaika who introduces the Keratinology products and takes you on further into the studio. You can enter your name and upload a picture or use your webcam and answer a few questions to get started at the studio. Select any one of the treatments you would like at the studio from hairstyle, haircut, hair colouring, etc. At the end of the session, you will have a virtual makeover in the form of an image that you can download. The application recommends you hair products that go best for the treatment you have chosen. And at the bottom are displayed the links with more details about the products. The other two sections are ‘Sunsilk style diaires’ and ’24×7 Expert advice’. Style diaries is an interesting take with the story of Tanu and Jia and the hairstyles they come up with for various occasions. The story, however, moves in the way you take it forward – there is a choice of two situations at the end of every little story. Expert advice has solutions for all kinds of hair problems, hair cuts & styles and hair care from the experts, Jamal Hammadi and Rita Hazan. The Sunsilk range of products displayed on the shelves are also interactive ones – on mouse over, a textual blurb tells you about the product and what it is beneficial for. How good is the Sunsilk virtual salon? This is not the first time ‘interactivity’ has been enabled through a brand’s YouTube channel but Sunsilk has set new benchmark in user interactivity. It is like having a virtual shop on the internet that gives live demos and expert opinions. The virtual salon concept is a killer especially for a product that promises to bring salon-style treatment into your homes. For starters, I’m happy with the choice of the medium. Videos offer the best medium for product demonstrations and how-tos. The YouTube channel further strengthens its position as the hair experts and sits well with the ‘co-creation’ brand positioning. The other thing that stands out is the interactive design. If that is taken out of this entire campaign, the studio wouldn’t be half as fun, despite the helpful videos. The ‘interactivity’ has certainly changed the game. Besides, one can easily buy a product right away. I’m sure the likelihood of buying a product increases after having watched a live demo and displaying the ‘buy the product’ link right beside the demonstration area is a clever move indeed. How cool is a campaign that leads to sales! The integration of other active social media platforms like Facebook and Twitter further add to maximise its visibility. The design and execution is top-notch. Beautiful layout, colours and smooth navigation along with interactivity provide for a wonderful user experience. The only problem I had with the campaign execution was the self-starting video featuring Malaika welcoming you to the salon when the home page loads. The brand can trust women enough to start the video on their own! Nonetheless, I liked the option to mute the background sound and the ability to move about anywhere and not get lost! I am certainly going to be a regular at this salon, how about you? And what do you think about this new rage of brands adopting YouTube? Do share your opinions below.